Living with low income affects family well-being and put at risk children’s development and quality of life. This is one of the key findings of a new study published by the Society of Saint Vincent de Paul (SVP) and the Vincentian Partnership for Social justice (VPSJ). 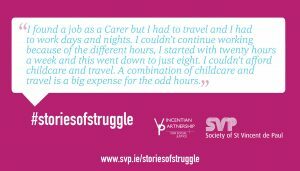 Titled Stories of Struggle, the report shines a light on what it is like for families who cannot afford a minimum essential standard of living (MESL*). 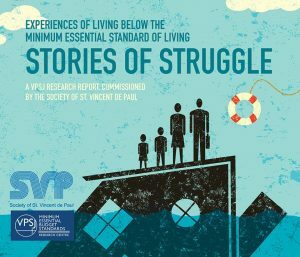 Launched at SVP’s national office by Ms Regina Doherty, TD, Minister for Employment Affairs and Social Protection, the report details the struggles of 30 families. The families are anonymous in the study, to give them greater freedom to speak openly to researchers. The day-to-day reality of these families is that parents juggle bills, worry about big expenses and struggle to provide sufficient healthy food, as well as activities for their children such as school trips and birthday celebrations. However, parents do give priority to the needs of their children over their own and often worry and feel guilty that they are letting their children down, the report found. He explained that the impact of living on an inadequate income is multi-dimensional so it is not easy to fully understand all the consequences of ongoing disadvantage, as well as the physical, psychological and social toll on the lives of children and adults. Dr Bernadette MacMahon, DC, VPSJ director, commented that while each household’s experience is unique, three similar stories emerged: “Those who cannot make ends meet, those who struggle to make ends meet and those who can just about make ends meet but with difficulty. “Having debt and arrears, facing extra costs due to illness or disability and living on a low income for a long period of time added to the difficulties of some families in making ends meet. On the other hand, having savings, access to good public transport and employment opportunities, and strong supports from families, friends and schools helped some families with low incomes to make ends meet, albeit with difficulty,” Dr MacMahon said. Stories of Struggles found that the high cost of housing was the single most cited driver of income inadequacy. This was followed closely by unemployment and family break-up. The inability to access affordable and good quality childcare forced families into unemployment, or restricted the hours they could work. Most families interviewed could point to specific events that lowered total family income such as the death of an immediate family member, losing a job or having hours reduced, rent increases, a car accident, the birth of a child with special needs, a family separation or a parent’s illness. Ms Fahey highlighted policy recommendations that would help struggling families, such as more investment in housing, childcare, health and transport so that families are supported to find a way out of poverty and income inadequacy. She said social welfare rates and the national minimum wage need to be benchmarked against the cost of the MESL in recognition of the real costs being faced by families. * A Minimum Essential Standard of Living (MESL) is the minimum needed to live and partake in Irish society today, meeting the physical, psychological and social needs of individuals and households.